The Mark Mangino era is over at Kansas. ESPN.com's Joe Schad is reporting that Mangino has agreed to a buyout to leave Kansas after eight seasons as the Jayhawks' coach. Kansas players apparently will be told at a meeting later tonight. The Mark Mangino era at Kansas is over after eight seasons.It's not surprising that Mangino has decided to take the buyout and leave the school after the serious allegations of Mangino's treatment. Several past and former players have surfaced to complain about Mangino's treatment. 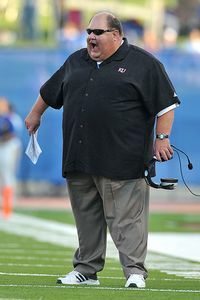 Other current and former players have backed Mangino's tactics. Mangino's ability to lead the program was crushed as soon as a multitude of players came forward to complain. It would have been impossible for him to effectively recruit, particularly in a conference as competitive as the Big 12. Mangino finishes with a 50-48 record at Kansas. He finishes only two victories behind Kansas' all-time coaching leader, A.R. "Bert" Kennedy, who coached the program from 1904-10. His career was marked by unprecedented highs for the Kansas program. The Jayhawks qualified for back-to-back bowls in 2007 and 2008 -- a feat never accomplished before in school history. Their 2007 team claimed a victory over Virginia Tech in the Orange Bowl, the first BCS bowl in school history. That team claimed a share of the Big 12 North Division title and Mangino was named the Eddie Robinson Trophy winner by the College Football Writers of America. But Mangino's program unraveled after the Jayhawks started this season 5-0 and then lost their final seven games of the season. Critics had a field day after Mangino inexplicably tried two passes, resulting in a sack and a safety against archrival Missouri while nursing a three-point lead with about 3 minutes remaining. After the safety, Missouri drove down the field and kicked a game-winning field goal as time expired. Mangino inherited the Kansas program in 2002. He arrived at Kansas after serving as Bob Stoops' running-game coordinator at Oklahoma. Earlier, he was the line coach on Bill Snyder's staff at Kansas State from 1991-98. I always admired Mangino's determination to coach his way. But that stubbornness eventually ended up doing his program in. And his demise reads as a cautionary tale to coaches everywhere.